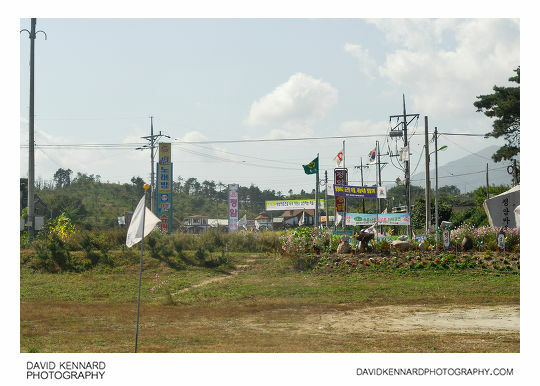 Carrying on along the National Route 7 Highway, we come to Ganghyeon-myeon (Hangeul: 강현면; Hanja: 降峴面), and Jucheong-ri (Hangeul: 주청리; Hanja: 酒廳里). (If you're confused by the -myeons, -ris, and -eups, Wikipedia has a good article explaining the administrative divisions of South Korea). In the photo above you can see the Condotel called the 'White House'. Underneath the English signage, it has the translation of White House in Hangeul (백악관), and written vertically down the side of the hotel it has the Hangeul transcription of White House (화이드하우스) - 'Hwayi de House'. 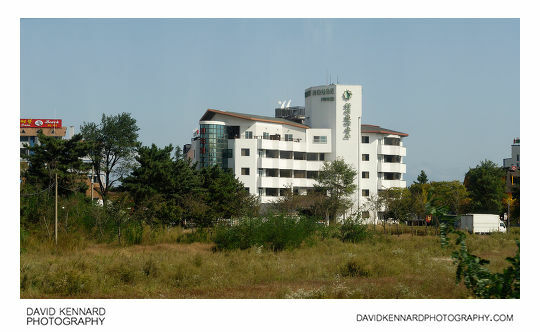 Above is another hotel, this one located in Yongho-ri (Hangeul: 용호리; Hanja: 龍湖里). 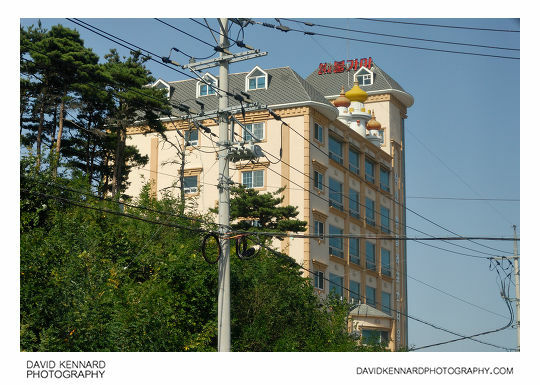 On top of the hotel it has some onion domes, I'm not sure of the relevance, but I also saw a hotel in the nearby town of Sokcho with the same style of domes on top (photo to come in a later post). I'm not exactly sure what the hotel's name is either, down the side of the building it says 낙산찜질레포츠타운 , which Google Translate translates to Naksan foment leisure town . The shot above is looking east, from my seat on the opposite side of the bus. 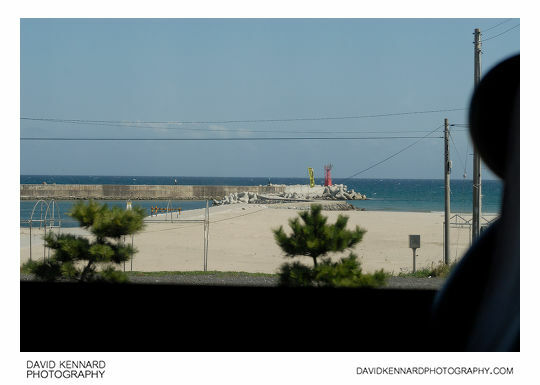 Here you can see a dock and the Sea of Japan, or East Sea as some Koreans prefer to call it. 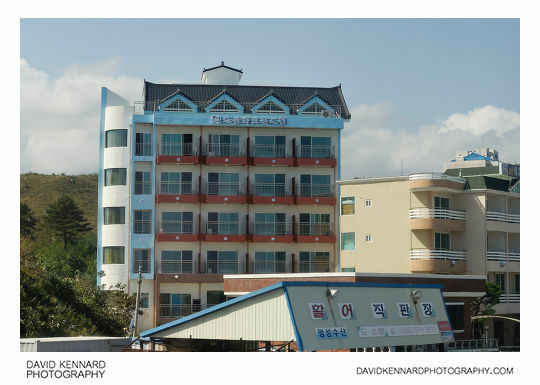 The Ocean Park Hotel (오션파크콘도텔), above, in Jeongam-ri (Hangeul: 정암리; Hanja: 釘岩里). To the right and in front of it is the OK Beach House (ok비치하우스). As you can imagine, the coastal towns have quite a few hotels. To me, the above photo looks like it is of a motorway service area with a few different shops and restaurants. But actually, this is Jeongam village (정암마을), which does, of course, have a few different shops and restaurants. But also it has homes, and they do some potato farming. They have had a village website, which was located at http://www.jeongamri.com/about/about_01.html.